If you enjoyed the puzzle and don’t already subscribe to Magpie, may I suggest that you do so without delay! A second Listener from Mash but it is his two contributions to the free issue of The Magpie (60½) that have left by far the stronger impression on me – they were simply superb. As it happens, the first of these was also carte blanche, Sixty (Carte Blanche et Noire), with the second an E-grade numerical! In his editorial introduction, Mark said that the two puzzles had apparently taken Mash at least two years to compile. So, the level of anticipation here was at an all-time high and I must say immediately that we were not disappointed. Well, we have seen some formidable preambles but this one was positively intimidating with its talk of mirror symmetry on both diagonals and that ominous note at the end – a specialist source may provide more information. And then there were those strange down entries – we were told that they were to be jumbled only to be given the exact order of this jumbling. What on Earth were we getting into? 17ac Spot a feature of Guinness? (9) whitehead – Cryptic definition I originally had blackhead. The order of the columns was not yet fixed as above. Columns 2, 3 or 10 could equally be column 1 and the grid numbers would still fit. We now had to transfer the contents of this initial grid to the supplied 15 × 10 submission grid. It did not take too long to realise that if we cut the grid in half then the across entries in the lower half fitted nicely in-between those in the upper half except that now they read from right to left. In addition we had Klein bottle appear on two diagonals (presumably the 11 cells to be highlighted) but no clash as far as I could see. I looked first at the 8th letter of each clue. We started with FUN (well the grid was certainly that!) but I gave up after FUNEAEENTAL was revealed – this was to prove costly. I looked at every 8th letter in all the clues. Remembering Nod’s recent Caesar Cipher puzzle, I then shifted the first letters of clues forward and back by eight letters. I similarly shifted the last letters and the first letters of every 8th word in all clues (too few individual clues reached eight words in length). I then had to resort to the unthinkable and looked at the initial grid reading every 8th letter in normal order, from top to bottom and then again in the boustrophedon manner. 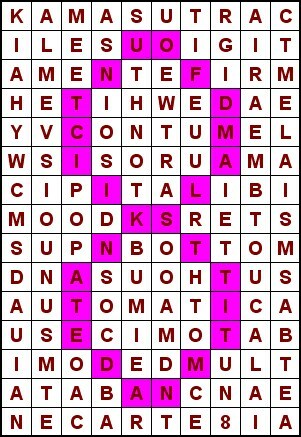 I shifted the letters of the entire grid both ways and repeated 5 above. 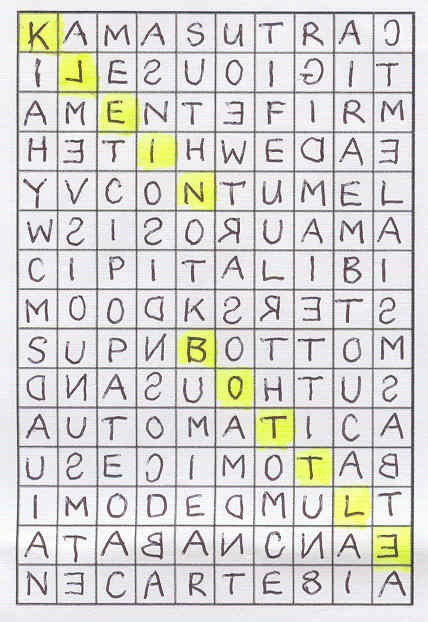 I repeated 5 and 6 with the completed grid – after literally hours I had found nothing but nonsense since starting the search. Well, the first part meant nothing to me so it was time to look at that specialist source Wikipedia. A fascinating article, especially the fact (if true) that Klein had originally referred to the Klein surface (Fläche) rather than bottle (Flasche). The mathematics is of course totally beyond me. However, the message added little to a puzzle that had already been completed so I wonder if Mash had once intended that we write Fundamental Polygon in a box beneath the grid. As frustrating and ultimately unhelpful as the search for the hidden message was, my enthusiasm for this puzzle was not dampened and I would vote it my pick of the year to date. I did not find it the hardest (Jumping to Conclusion by Sabre) or the trickiest (Number or Nummer by Ruslan) but it was quite definitely the most fun. Many thanks Mash and I sincerely hope that you will find the time to return to the Listener in the not too distant future. Mash! We had been warned. He is one of the smarty pants Magpie gang. There was even insider information circulating that this was going to be a carte blanche, so we downloaded it with some trepidation – then breathed a sigh of relief. Just a sweet little 10 X 15 grid. Even the numpties should be able to polish that off in no time. Relief was short lived.’In the initial grid (not shown) of 30 rows and 10 columns …’ We were about to set off on a journey with limited resources, so we printed ourselves a few 30 X 10 grids. …’entries are separated by empty cells instead of bars.’ We were helpfully told that all entries were nine letters long, so the task didn’t seem too daunting. 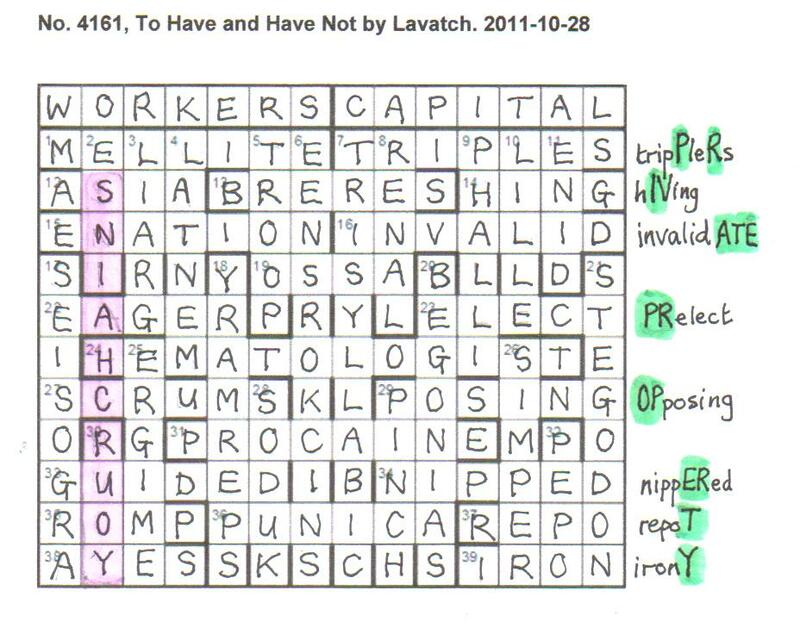 Clearly 15 across clues, with blank lines between them, would fill thirty rows. The other numpty, as usual at this stage, made a wild guess that proved to be not far off the solution. “Looks to me as though we’ll be creating a Moebius strip”, he blandly announced. There was a certain symmetry in the clues. 1, 10 and 19 had both an across and a down clue, so it was likely that we were going to produce three 10 X 10 grids for a starter. There was that insidious little addition that ‘When an entry goes off the right or bottom edge it continues at the opposite edge’. Still, it was worth a long shot that 1 across and 1 down (and their mates) would be on the left hand side of the grid. 3 would have to be on the third row and 2 would go somewhere in between. What did we get? WHISKY MAC (KIAHYWCMS) and MALVOISIE (IALMEVSIO) Ah yes, true to Listener setter form, Mash was imbibing a fairly lethal mix of alcohol in his clues, the Malvoisie, Whisky Mac, Guinness and a ‘possible worker’s drink’ within a mere thirty clues. Not surprising then the ‘almost drunk’ in the last clue! THUMB KNOT (THNOTKBUM), COLUMBATE (EMBOUTCAL), APOCOPATE (POPATOAC), CHEMOSTAT (THTOMCEAS), ACUMINATE (AUIANCTME), OUTERWEAR (EARUOEWTR), MITIGATED (GIDMAIETT) – nice one there, a mini plug for the Magpie – but should we be wondering, at that stage about the intriguing structure of some of these clues? I repeat that tip Samuel once gave. 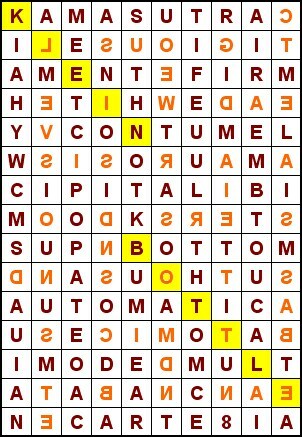 Scan the first and last letters of the clues in both directions before even starting to solve. OK, I know, in retrospect that the message was cunningly (sneakily?) concealed in the eighth character of the clues (not counting spaces): FUNDAMENTAL POLYGON 4th DIMENSION. We had been warned that this hidden message was not needed for successful completion but that it described the submission grid ‘A fundamental polygon’ and what solvers would need to construct an ideal form. I thought the fourth dimension was ‘time’. The numpties certainly needed that! Onwards! USODICONS (IOSIDNSOC), METABASIS (AISMSABTE), MASTODONS (SOOAMDNTS), ANTISERUM (NUSMTEAIR), TUMESCENT (TUNSMEETC), and BEAUTIFUL (BATIFEUUL). There was a lot of cold solving here, though fortunately the clues were so fair and gave us some hope of finding our way through this maze of letters. Once our gridfill was underway, we were able to work backwards from those number jumblies to find the remaining words and a full 10 X 30 grid appeared. We had to ‘think this over’ and ‘see through’. Well, it isn’t easy to see through those black lights I had used to construct the grid, so I made myself a new one and thought it over – sadly coming to a speedy but flawed conclusion. It seemed perfectly obvious that those words and spaces in the lower fifteen rows had to be incorporated into the upper fifteen and this worked perfectly well if the lower half were inverted. What genius Mash! Up they went and, sure enough eleven letters appeared. KLEIN BOTTLE. Bit of Google research – those down clues have to twist so that, where they come back into the structure at the top, they are the other way round. EUREKA! Was that all? Time for bed after a whisky mac. The cold light of dawn produced dismay. Invert the entire grid, read it upside down, backwards, whatever, we could not read that KLEIN BOTTLE ‘partly from ‘right to left’. It invariably went in a single direction. We were travelling by now and the car was soon filled with scraps of frustration, as I failed to find a clash that would combine into a digit. The clue was there – all those I, A, U, H, T, O, M characters cropping up (or down or backwards) in the down clues but it took me 24 hours before (after midnight at Doc’s Budock Vean crossword-lovers’ gathering) light dawned and the other numpty found me with the grid pinned to the lampshade (using the pin from the Haig’s remembrance day poppy) and copying letters in reverse onto the top half of the grid. YIPPEE! Of course, the rest is history. One character appeared in both directions. S superimposed on a reverse S gave that little (‘the number of the column it appears in’) and we now understood why those eighth characters had been so suspect. Some of KLEIN BOTTLE was read in reverse – just a couple of Ls and an E but that sufficed. The other Numpty knows all about Klein bottles (says they are purely theoretical and cannot be produced but he’ll have a go!) and about fundamental polygons. I am not sure how to submit one of those but certainly know that it is not easy to put those letters into the grid in reverse without inadvertently ‘correcting’ one of two. I wonder how many solvers will have done that! So the Numpty decided to have a go at constructing a Klein bottle. Now where do you find a transparent piece of rubber capable of being twisted and inverted and ending up inside itself? We had a couple of somewhat unorthodox ideas I was not willing to pursue, so we ended up merrily emptying a funny twisted bottle of cheap Chardonnay so that we could attempt to create this wild theoretical thing. The result was rather a boozy disaster. What can I say? Brilliant, tnaillirB, brilliant! There were pdms all the way through. How on earth did Mash create this spectacular puzzle? I shall be more than miffed if we don’t read a setter’s blog! This is Mash’s second Listener. His last, with a Rugby Union theme was back in 2006, and that tripped me up, so I was determined to succeed this time. The trouble was that Mash, like Pointer three puzzles ago, is a regular Magpie setter … and most of his puzzles are a grade D (difficult)! This did not bode well, unless he had set an easy puzzle that was rejected as too easy for Magpie by its editors! That particular thought soon vanished after I read the preamble. 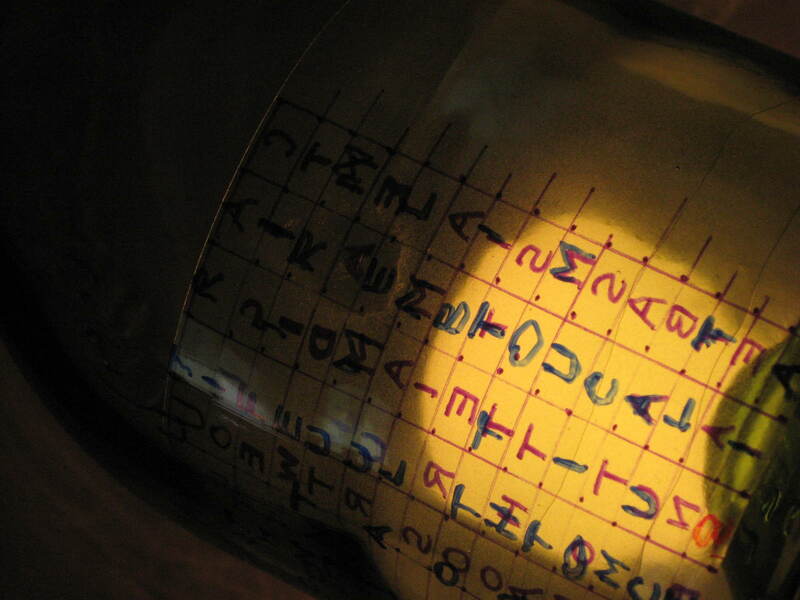 For a start, we had to ignore the printed grid since it was too small for the initial solution to the clues. 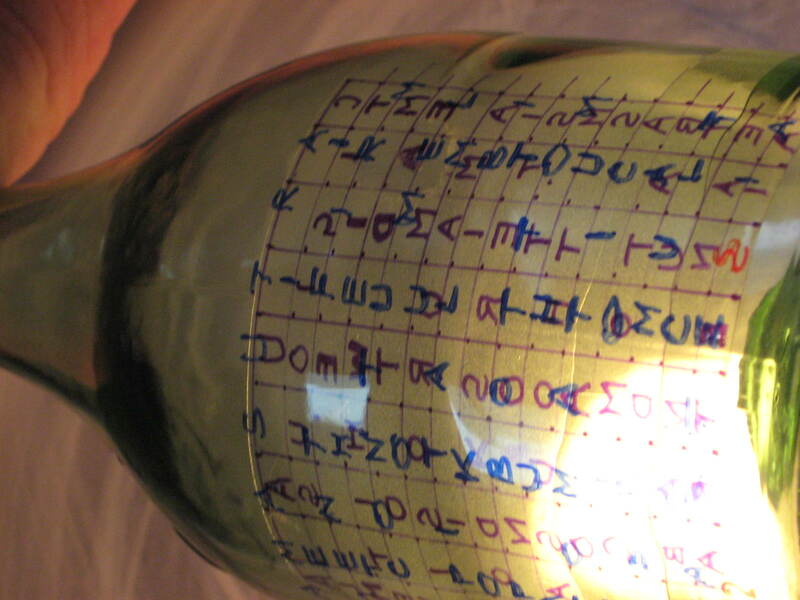 The clues themselves were normal, but the down entries had to be jumbled before entry. At least we were given the order in which they had to be jumbled; I suspect that if this had been a Magpie puzzle, such help would not have been given! The last half of the preamble (which struck me more like a pramble) went on, in a very cryptic style, about what to do once we had completed the original grid. Don’t let it be said that the Listener doesn’t give value for money! I started on the clues. Bingo! 1ac was KAMASUTRA (which I had thought was always spelt as two words … not that I use it a lot … either as a word or a reference manual!) and 3ac was FIRMAMENT, and I was off to a flying start. Eight more answers came over the next 30 minutes, but I soon came down to earth with a bang, as clues were solved more and more slowly. When I got 10ac Gold, sometimes tinned fruit, chopped, in chef’s first non-stick jam jar, I realised that Mash was superbly devious, giving us AU (gold) + TOMAT[o] (sometimes tinned fruit, chopped) + I (in) + C (chef’s first) = non-[gear]stick jam jar (rhyming slang for car). After exhausting as much cold-solving as possible, I decided to try and enter the dozen answers I had into the grid that was not supplied by the editors! Luckily a Word table 10 × 30 was easily produced. However, in the interests of full and frank disclosure, I have to confess a stupid mistake that only became apparent as I did this. The 9 digits in brackets after the down clues were supposed to give the order of letters. Thus, 5dn COLUMBATE was 956824173. I had initially marked this to be entered as AMEBOLTUC — in other words, the C went in position 9, the O in position 5, the L at 6, and so on. Instead it was (would ‘obviously’ be appropriate here?) EMBTOUCAL, with the 9th letter appearing first, the 5th appearing 2nd, the 6th third, and so on. The only thing I hadn’t checked at this point was the symmetry of the grid which was mirror along both diagonals. I used Excel to produce the diagram to the right. I know we weren’t told that the symmetry was along the main diagonals, it seemed to me that it should be. 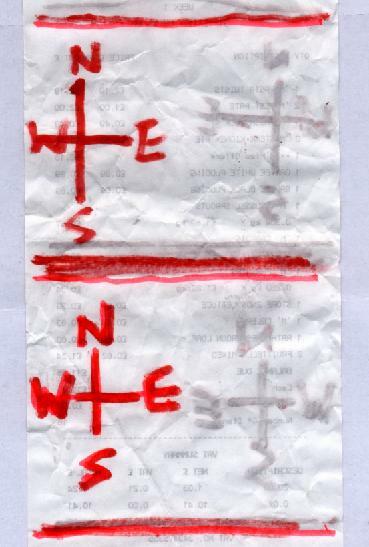 In the grid here, although there is symmetry about the NW-SE main diagonal, it is only symmetric along one of the other NE-SW diagonals. I must have been missing something, but wasn’t too sure whether it was important. 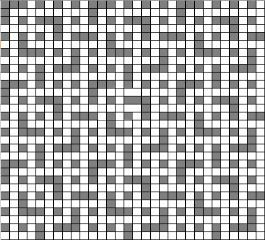 The next step was to transfer my solution to the 10 × 15 grid that was supplied by the editors. Well how? We had to think it over and see through it, so presumably inverting it in some way. I entered my grid into Sympathy to produce a neater version where letter patterns might be more easily spotted. There was nothing about using scissors, so I spent some time trying to twist it in some way (reference the title). Luckily, a game of golf interrupted my cogitation. … except that, of course, as I write this blog (well after the closing date), I realise that BEAUTIFUL had to be entered as BATIFEUUL!! Whether this mistake was the cause of my total failure to find the hidden message, who knows. I will await the printed solution to see where the clashing letters actually occur, since I am in a mild form of the sulks. 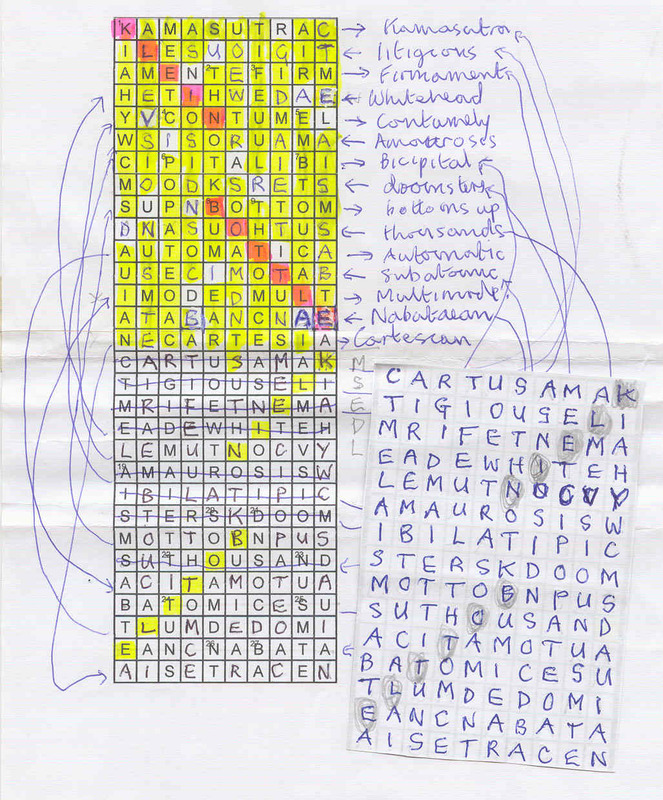 Anyway, I looked at my diagram using KAMASUTRA in the top row, then tried CARTESIANS in the top row. I then realised that the whole grid could be inverted. In fact, it could be entered in a whole host of ways — for all I know, KAMASUTRA appeared backwards in the seventh row, starting in column 4! Brain strain got the better of me, and I turned my attention to finding the hidden message, which although may not be needed for successful completion, may in this case actually help me complete it. Alas, this too was unforthcoming, try as I might to deduce it from the initial letters of the clues advanced a certain number of letters, or the initial letters of the nth word, or the nth letter of the clues, etc, etc. Again, no luck, and I eventually conceded defeat. I have not been in touch with anyone else to see whether they have or have not completed Mash’s offering, nor have I checked in at AB. I am hoping that I will be awe-struck when I finally see the solution in print. I suspect that I won’t be able to wait until I get Saturday’s Times, but will check in at the crossword site shortly after this blog appears. I will then read Shirley’s account of her successful solve, followed by George v The Listener and his success strory. I will then read the many posts on the Crossword Centre Message Board congratulating Mash on a great puzzle, and saying how the penny drop was so worth the effort. Then again, perhaps none of these expectations will be forthcoming, although I naturally hope the first two are! Whatever happens, congratulations to Mash for stumping me once again. I look forward to the solution with huge anticipation, and will write my thoughts at that time in the post postscript below. Well I did see KLEIN in the grid, but not seeing BOTTLE I thought nothing of it. If I had read the definition in Chambers, I’d probably have felt sick! I think the main reason that I stumbled here was the phrase “reading partly from right to left”. This made me think that the hidden information could go in any direction rather than in straightforward diagonals. The hints were there however, from the wording of the preamble to the many vertically symmetrical letters and the grid not being quite symmetrical about both diagonal axes. All these are mentioned in the blog. Not reading “klein bottle” in Chambers was also a big mistake, although I have no idea whether I’d have seen BOTTLE lower down in the grid. A tour de force from Mash which I would normally have expected to see (but not attempt) in Magpie. Perhaps this is a taste of things to come under the new editorship. I’d better sharpen my wits! “Ah,” said the Numpties, “a familiar name!” Of course, we see Lavatch regularly in the Spectator and the broadsheets and in the BBC CiNA 3D crosswords too, and we know that we can expect a high quality of cluing and, more likely than not, a challenge. Fortunately, our next two solutions gave us the first breakthrough. 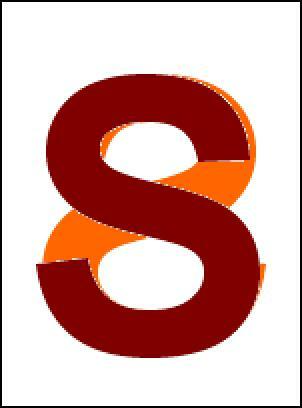 TRISYLLABIC appeared as a generous anagram, ‘Political party stopping original lyricist halving a number of linguistic units (11)’ and produced another extra letter (an L), then an anagram solver produced SNICK OR SNEE at 6d and we postulated that it had to go into the grid upside down. We were on our way! A couple of hours into solving and much of the right-hand side of the grid yawned empty but TRIPPLERS, INVALIDATE and PRELECT seemed to show us the way forward. ‘In the right half, the problem of excess requires some answers (which have normal definitions) to undergo a different thematic treatment.’ Isn’t it delightful that, in retrospect, this is so blindingly, dazzlingly obvious? We stumbled along, deciding that real words were going to be entered with a few letters removed from the original defined word (so TRIPLES went in in the place of TRIPPLERS, removing the extra P and R, HIVING was entered as HING giving us an IV, INVALID gave us ATE, ELECT produced an extra PR, OPPOSING produced OP, NIPPERED gave us ER, REPOT gave the T and IRONY completed PRIVATE PROPERTY. A fellow solver asked me how we know that we should look for that kind of device. My answer is “Just keep on doing these brutes, week in, week out, and eventually one learns to look up every troublesome word in BRB, search for tricks reading upwards, backwards, diagonally, in circles and so on, to chop and reconstruct grids, fold them into bird shapes or tori with peculiar graphs winding their way round them, divine the meaning of invisible inkings, or draw gothic keeps”. 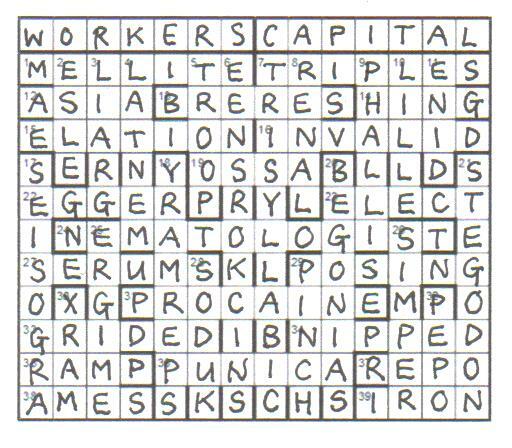 From PRIVATE PROPERTY and REVOLUTION, with the letters RWRKSOE and LAPAICT appearing as the missing and extra letters (what fine thematic symmetry – the poor workers were defined by the missing ones and the rich capitalists by those with an excess of letters!) it was a short step to MARX and ENGELS and we clearly had to find those chains so that we would have nothing to lose but ‘YOUR CHAINS’ Sure enough, losing the chains was part of the revolution. This was a triumph. Many thanks, Lavatch.